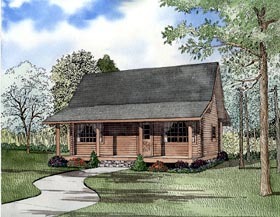 This quaint little log home plan has a cozy Covered Porch in front perfect for a swing. The Living room opens to the Loft above providing natural light throughout. The Dining/Kitchen area has access to Rear Grilling Porch. To the left is a Bedroom with a lovely bay window and walk-in closet. Upstairs you will find an additional Bedroom and Loft with ample closet space.